-Curd grind with sour cream and sugar. Add the eggs, candied fruit, pudding and raisins. All grind to a smooth paste. — Steamed poppy and three times to grind on m «grinder with nuts. Add the raisins, candied fruit, sugar and eggs. All knead. Form h cm covered with parchment paper. Vylojyt poppy mass. On top of cottage cheese. Pour over top of chocolate mass. -For chocolate beat eggs with sugar in a magnificent mass, with a mixer for 5-6 minutes. Easy to mix with flour, cocoa and baking powder. -Bake for 35-40 minutes at 190 * C.
-The cooled cake to turn on parchment paper sprinkled with sugar and remove from the top of the cake parchment. -For the cream sour cream mixed with egg, coffee and sugar. Brew until thick mass. Cool. Beat butter in a magnificent mass. 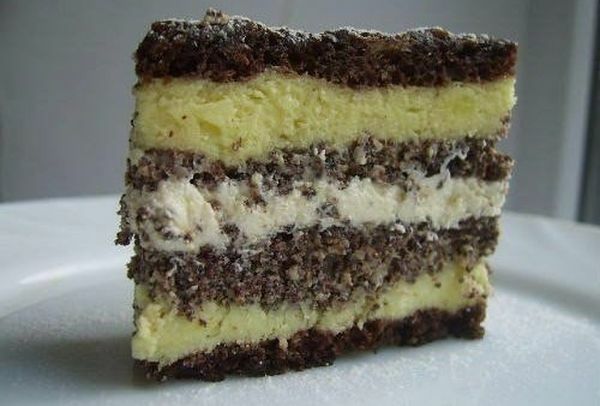 -The cake cut into 2 parts. One part (poppy up), spread the cream. From top to put the second part of the cake the Mack down.